0) 12 channel push button tuning, 1x14W, Hi-Fi two way loudspeaker and headphone socket, automatic contrast control, anodised aluminum rear cabinet trim. 1) 8 channel basic remote control, 1x6W full range loudspeaker, pressed steel rear cabinet trim. 5, 7, 8) 16 channel remote control, 1x14W, Hi-Fi two way loudspeaker and headphone socket, automatic contrast control, anodised aluminum rear cabinet trim. 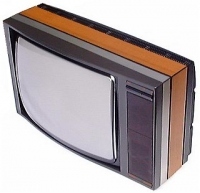 A choice of cabinet finishes was available, for the Beovision 9000 cabinet model, which included a sliding door over the screen that also operated the mains switch, rosewood was standard, with oak as an option to special order. The other models were offered with a choice of finishes for the cabinet inserts, teak and rosewood being standard, and some of the more expensive models available in white to special order. Some of the 8 channel basic sets came with grey plastic inserts. Text copyright © Beocentral. Unauthorised reproduction prohibited. 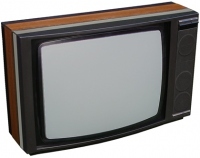 All remote control sets used the same slim Beovision Video Terminal remote control, which had buttons for the optional teletext decoder (standard on Beovision 9000) and for a B&O video recorder, the V2000 based Beocord 8802 V being available at the time. Text copyright © Beocentral. Unauthorised reproduction prohibited. A range of elegant trolley stands were available for the table models, and the larger ones could be fitted with a shelf for Beocord 8802 V. Text copyright © Beocentral. Unauthorised reproduction prohibited. Technically, the 33XX series was a welcome return to old habits. Once again, a separate line scan amplifier and EHT generator were used, though the modern transistorised circuitry was much simpler than valved stages of the 3000 range. Power consumption was also impressively low, and reliability high, though the heavy EHT transformer could crack its soldered joints and cause various problems. Automatic cutoff adjustment was of course included, and the number of controls needed to set up the tube was drastically reduced, there being only one convergence adjustment in the 30AX tube system. Text copyright © Beocentral. Unauthorised reproduction prohibited. 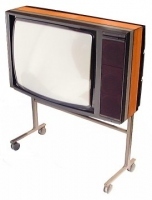 All models, from the basic Beovision 5100 up to the Beovision 9000, used the same printed panels and tube types. Cheaper sets lost functions, not quality. All but the 8 channel remote sets had a resin loudspeaker enclosure mounted on rubber blocks, housing the woofer loudspeaker and a bass reflex port. The tweeter loudspeaker was housed in the tuner drawer. The grilles at the front of the set have embossed circles to show that the Hi-Fi loudspeakers are fitted, and there is a headphone socket of a special design whereby pushing in the headphone plug fully mutes the loudspeaker, but pushing it only partly in allows headphones and the loudspeaker to operate at the same time. The 8 channel models used a single loudspeaker with no enclosure but fitted with a foam block at the rear. On these models, the grilles are plain, and there is no headphone socket. Text copyright © Beocentral. Unauthorised reproduction prohibited. 16 channel sets have an on screen channel display, but this is not fitted to 8 channel ones, so it is not possible to tell which channel is selected, other than by identifying the programme! The 77XX Series consisted of Beovision 5102, 5502, 7102, 7202, 7702, 7802, 8102, 8202, 8802, 8902, and 9002. 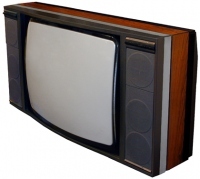 Beovision 5002 was not part of the range it belonged with the 33XX models. Text copyright © Beocentral. Unauthorised reproduction prohibited. These sets look very similar to the previous 33XX series, the main difference being that they are fitted with electronic frequency synthesizer tuners. The “2” at the end of the number indicates that the set is a 77XX model. Text copyright © Beocentral. Unauthorised reproduction prohibited. There are two additions to the range, Beovision 7802 and Beovision 8902. These are stereo sets with built in 2x15W stereo amplifiers and two sets of loudspeakers of the type fitted to 16 channel 33XX models, one set on either side of the screen. 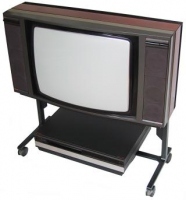 This positioning gave an excellent stereo perspective, but made the sets, Beovision 8902 in particular, very large. A2 stereo decoders were fitted, as were stereo AV connectors, so that the sets could be used with the VHS Hi-Fi Beocord video recorders such as Beocord VHS 90, and later Beocord VHS 91. Of course the Beovision Video Terminal remote control could also operate these models. Text copyright © Beocentral. Unauthorised reproduction prohibited. Sadly, there was never a “91002” stereo cabinet model, though what a set that would have been! The rest of the range carried on as normal, the new tuning system being the only real change. The Beovision Video Terminal was slightly updated, and was now finished in light grey (it was previously black), and had markings for extra “tune” and “store” functions connected with the new tuner. The back cover of the set was also painted a matching light grey, this was also previously black. Text copyright © Beocentral. Unauthorised reproduction prohibited. Teletext remained optional on all but Beovision 9002, and the option of a 21-pin AV connector was added. Sets finished in white could now be bought with an all white Video Terminal, though a white version of the Beocord VHS 80/VHS 90 was never offered to complete the package. The push button sets had been quietly dropped by this stage, and the basic sets with full range loudspeakers would also disappear before the range was finally dropped. Text copyright © Beocentral. Unauthorised reproduction prohibited. The 33XX and 77XX series Beovisions were a very successful product range for B&O, selling may thousands of examples, and have proved to be the best quality and most durable sets they have yet offered. They were replaced by the L/LX series, which were based around the Philips 45AX tube, which despite being a very high technology product, was dogged in the early years by manufacturing problems and poor reliability, spoiling the performance and long term reliability of the sets that used it, the new Beovisions included. Text copyright © Beocentral. Unauthorised reproduction prohibited.